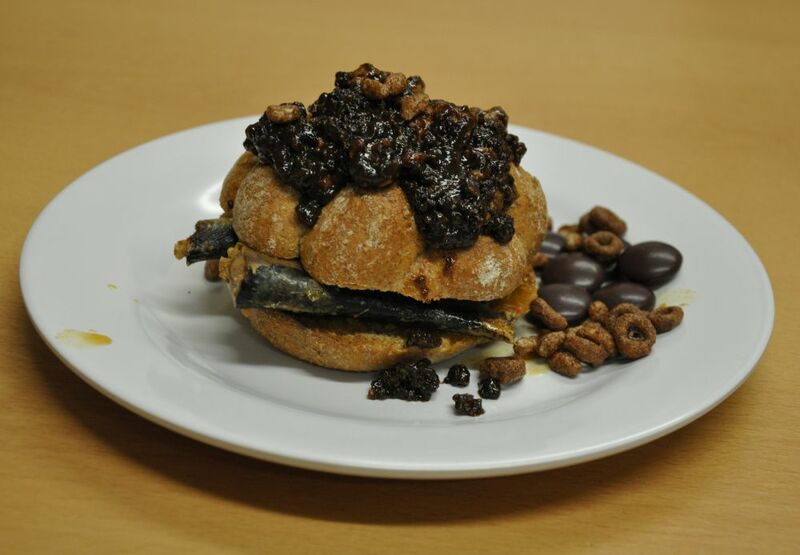 Don't be overawed by the name of this dish - its preparation is very similar to a straightforward chocolate sardine sandwich, but with a few adjustments that make all the difference in the end. Mix the coco snaps and chocolate Cheerios and put them onto a flat surface. Using a meat tenderiser, a Viking hand axe or a sutekki-noriten or, if you don't have any of those to hand, pretty much any other utensil, or even a saucepan, lightly crush the cereals to a coarse grain. Put the mixture into a saucepan along with a handful of Minstrels and add some of the Grolsch. Carefully open the value lemonade so as not to spray everyone with it and add some of this to the pan as well. Heat until the chocolate has melted to make a coarse sauce. Remove the pan from the heat. Pour a little more of the Grolsch and the lemonade into a frying pan and heat. It will froth uncontrollably but just ignore it. When it is piping hot, add the sardines and a little of the piri piri sauce. 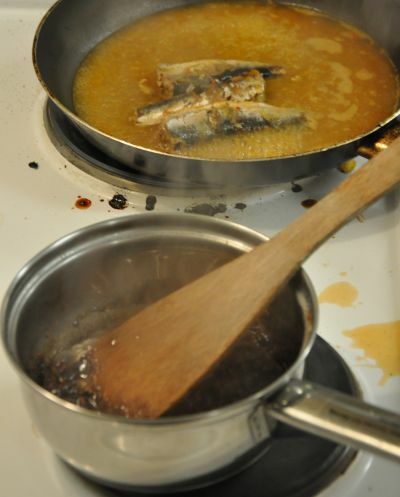 Let the fish poach gently as the sauce thickens into a sweet and spicy, fishy gravy. Once the fish is cooked, slice the bread roll in half. Place the cooked fish and a little of the gravy inside the sandwich. Pour the chocolate sauce on the top. 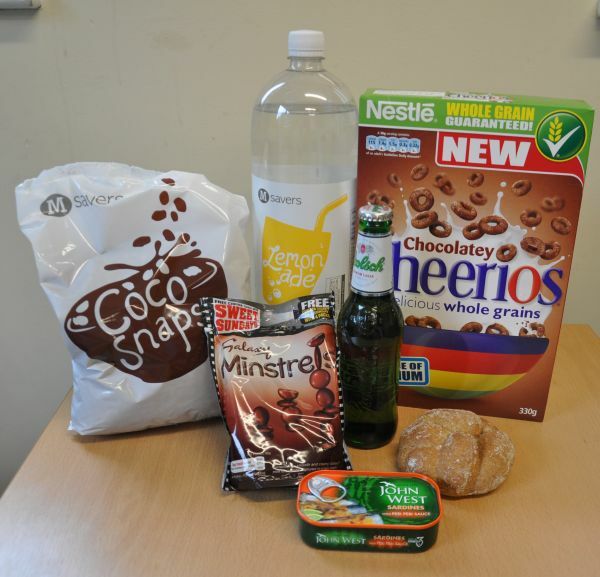 Decoratively arrange some of the uncooked Minstrels and cereals around the sandwich on a plate and serve. Andrew: "Sardines and chemical fallout - close the door!" Kath: "The fishy bready bit wasn't too bad, but then the piri-piri chocolate kicked in"
Alan: "I have heard the sound of Minstrels being beaten to death"
Kirsty: "There's something slightly horrific on this side of the bin"
Andy: "Sorry I drank your beer - just had to get the taste of chocolate fish out of my mouth"